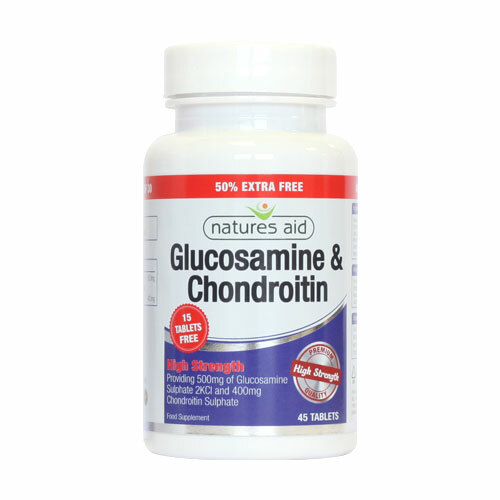 Natures Aid Glucosamine & Chondroitin Complex provides 500mg of Glucosamine Sulphate 2KCl and 400mg of Chondroitin Sulphate (Marine source). Glucosamine Sulphate 2KCI (product of crustaceans), Chondroitin Sulphate (product of fish), Microcrystalline Cellulose, Tablet Coating (Sodium Carboxymethylcellulose, Dextrin, Dextrose Monohydrate, Lecithin - product of soya, Sodium Citrate-Dihydrate), Anticaking Agents (Silicon Dioxide, Vegetable Source, Magnesium Stearate). Take 1 - 3 tablets per day with food, do not exceed recommended daily intake. Below are reviews of Natures Aid Glucosamine & Chondroitin - 50% EXTRA FREE 30+15 Tablets by bodykind customers. If you have tried this product we'd love to hear what you think so please leave a review.